Sarsen Technology Ltd is pleased to announce a new conduction cooled and rugged version of the Condor 3000x XMC card from Tech Source, Inc. 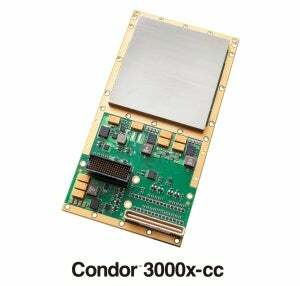 The Condor 3000x-cc is a leading edge XMC form factor graphics/video card, based on AMD’s E6760 GPU, for use in applications that require very high-end graphics and computation in a rugged format. Delivering 576 GFLOPs of peak single precision floating point performance, and 480 individual processing units (shaders), the Condor 3000x graphics processor is ideal for general purpose, graphics processing unit (GPGPU) applications such as ultrasound, radar and video surveillance. "The Condor 3000x family tests the boundaries of high performance computation in a small form factor rugged defence product and offers best performance per watt consumed," said Selwyn L. Henriques, president and CEO of Tech Source Inc. "GPGPU computing is gaining traction as a simpler way to do complex multiprocessing and our close collaboration with AMD has enabled us to bring this technology to the military/defense arena." The Condor 3000x-cc is a rugged XMC graphics/video processor with 1GB GDDR5 memory, and supports the latest versions of the APIs such as OpenGL, OpenCL and DirectX. The product supports up to six video outputs through its rear PMC or XMC IO, which could be a combination of DVI, VGA and DisplayPort. Supported by the industry standard OpenCL programming language, GPGPU application software development is accelerated with the AMD Stream Software Development Kit (SDK). Windows drivers are available by default.